But, as hurtful as a dislocated shoulder is, it's not as bad as a broken collarbone (I think). Butler comes into the team for Beauce. Mont-Megantic should suit him, but I'm less sure about the hurly-burly in the other stages. A few more drinks could be had tonight, three in the top eight on Megantic. Our Aviv Yecheskel just won the israeli Time Trial Elite National championship race. He finished with 45 sec advantage over 2nd place Omer Goldstein from 500 Watt. "It was a hard one because you have to give 120 percent from beginning to end but I am so happy. Its the first time I step to the top of the Podium in TT" said Aviv, who has an impressive debut season as a pro with us. Could the second place Goldstein find his way onto the team and join his brother there? Only 19 and if they're needing another youngster before Valle d'Aosta he looks a decent talent. The team does have one free spot (or 1 + some trackies) with Korus having left the team - not sure what happened there. Could the second place Goldstein find his way onto the team and join his brother there? Only 19 and if they're needing another youngster before Valle d'Aosta he looks a decent talent. Yeah, quite a string of decent results already for a 19-year old. The team does have one free spot (or 1 + some trackies) with Korus having left the team - not sure what happened there. We shall endeavour to find out in Sibiu. A successful Beauce for the team. Two stage wins for Raim and aggressive racing (nearly) throughout. The last stage was a bit of a let down though, but that's just mainly in contrast to what had come before. They went in with the intention of retaining the lead in the team classement "and hungry for another (stage) win and trying to get two other jerseys". However none of that came to pass. Turek gave it a go on the last lap for the stage win and to improve his GC position, but he got dropped fairly rapidly by Shelden and was lucky in a way to get caught by the leaders just when he had got over the climb (so he was able to retain his GC position). Lemus was unable to get any KoM points, Raim didn't get any sprint points and they dropped from first to fourth in the team GC. The last stage was a bit of a let down though, but that's just mainly in contrast to what had come before. Lesson to learn: Never big yourself up before a race, always be content with what you have. That leads to dull, streamlined interviews, so it isn't so very desirable (for the fans). Often safer - therefore, better - for the team, though. The Israeli Nats went according to the script (mostly, but see below). No embarrassing defeat to a young upstart this year. The team clear goal was to use the small hills on each lap to break the peloton to pieces. It took about 2 laps before there intensity took a toll on their rivals. Each of the riders took turns in putting pressure. But way into the first lap it was pretty clear who is the strongest rider: it was Aviv Yecheskel who was making the moves, attacking and breaking away. Still, we asked him to hold a bit for his teammates. ...... But never say never. The never surrender defending champion Guy Sagiv got rid of the last rival on his wheel and started chasing his teammate and best friend. He vowed before the race that he will do everything to defend the jersey. And he meant every word. Guy Sagiv did the impossible, closing a huge gap and passed Aviv in the last 200 meters. It was a dramatic win by a rider that never gives up. Yecheskel wasn't too happy immediately after the finish. Whether it was the early team orders or Sagiv chasing him down right at the end or a combination of the two. Anyway he "expressed his emotions in an inappropriate manner." He apologised though and the pair of them kissed and made up. The other winner so far was Malovec, who won the Slovak U23 TT title. Not sure we'll get to see a funky jersey for him though due to the lack of potential times he'll get to wear it (possibly never). They should at least give us a virtual design to salivate over! Problem solved as I think he won the U23 RR title today. So we'll get to see that at Valle d'Aosta. Mexican and Estonian kits incoming too. Miku was super active all along ng the race. Getting into the first breakaway of 14 and then another one, the 3 riders that went to the finish." In the last km it was a cat and mouse game between us. I started the sprint from second position and had good legs and power to finish it". Some more details about the victory in Mexico.
" The race started with 10 laps of a 2 Km circuit, and a break of 15 riders went away, we knew it wasn't really dangerous, we can afford up to 5 min before the climb. The last climb was really long, 35 km, and more than 1 hr, also the heat was a big factor today, so keeping calm and keep drinking and eating before the climb was really important, so I did that, and stayed focus on the climb. I felt pretty good, as the climb started the attacks started and I was on a group of 5 that caught the 3 last riders of the break like 10 k on the climb, I was dropped from 2 other guys a bit later, but I knew it was a long way to go, so I just kept my own pace, and stayed focus on it. I caught them back, dropped 1 rider, so it was just me and my cousin in the front, but he wasn't feeling good, so I left him behind like 13 k to the top, from there to the finish it was just a TT, measuring the effort, and as Nicki told me , dreaming of that great place that is the finish line. I kept control with my SRM, to not go over the red and crack, I had about a minute to a lonely chaser, and I won for a min, during the last km I could enjoy it a but more, I clapped to myself, I was really happy, I even start thinking of my new Jersey, about having the jersey in Europe and with the Cycling Academy Logo". This new tactic of putting half your team in the break and flooring it seems to be paying dividends. I don't see too many riders with decent climbing results in that top-11, so Turek could have a very good chance of a great GC result here. Also has to do with many of their riders simply being head and shoulders above much of the opposition in those 2.2 races. They won't be able to pull this off in Sibiu. I'll happily be proven wrong, though. Certainly here in Hongrie you are right, though Kolss are no mugs - best ranked CT team in Europe last year (taken with a large pinch of UCI salt). The Canadian races had stronger fields in comparison, but yes, Sibiu will be a bit different. Difficult to be sure what the finishing 20km circuit is like in Budapest tomorrow. It can't be that tough (4 x 1km at 5%? ), but I just hope they don't regret not letting Turek have a go on the climb today. If he could have overtaken Polivoda in the GC that would almost have been an unassailable position. Fingers crossed for their first GC victory! Article on the race and discussion of the incident. Middle finger and bike throw combo. Not very classy. Well they did it, but not without a few alarms. First of all Raim and Turek got isolated against five Kolss riders, then we had the incident with the traffic on the final circuit - riders having to pass taxis and buses on a roundabout. Finally Raim himself put in an attack with a couple of laps to go (did he think it was the final one?) and when caught he was hanging round the back of the group for a while. Onto Sibiu anyway. You got a start list yet Fus? 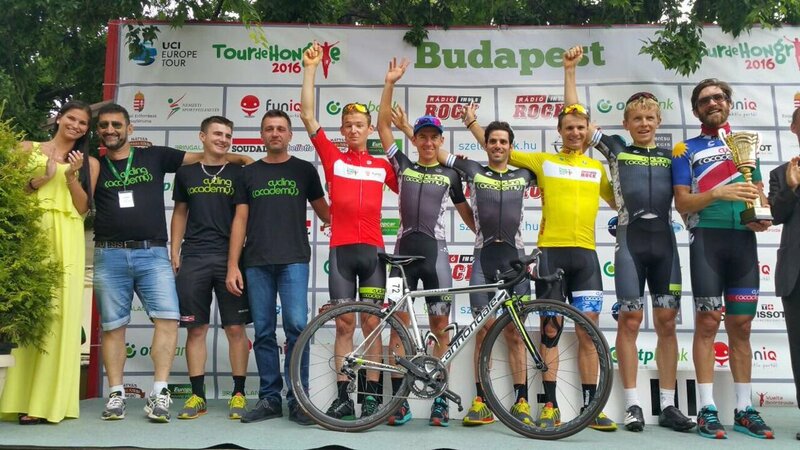 Raim took the GC in Hungary. Reckon he deserves a pro contract based on this season's performances and I'm not just saying that as a fan of Estonian cycling. Indeed I do (our Sibiu thread should go live today or tomorrow). For it's Piaskowy, Butler, Craven, R. Goldstein, Pavlič, Lemus. 1. Why did Max Korus leave the team? 2. Any races confirmed for later in the year (other than Valle d'Aosta)? 3. When will Boivin be back racing? 4. Will they be repeating the X-Factor audition for team places in 2017? Luis wasn't even on the long list for the spot back in January (and that was before his leg break), so he's defied the odds to make it. He should be wearing his new kit today btw. No chest eagle unfortunately. No confirmation from the team, but he's on the provisional start list for Aosta. Lots of big U23 names competing in general. Should be a good race. 5th, 9th, 12th and 13th on the MTF at Sibiu, but even so I think they'll be disappointed with the outcome. Even so lots of positives to take from the performances. Turek so strong even with yesterday's effort in his legs, Lemus suffering from jet lag but hanging in there, Piaskowy and Butler among the first to reach the line from the peloton (Butler said he was first - confirmation from our roving reporters?). The "what ifs" are the frustrating bits. What if Turek hadn't been in the break yesterday and what if the peloton had caught the break? Could Cab have won it and given the team a good chance of another GC win. That's cycling though I guess. Sometimes the dice just don't fall the way you want them too. Piaskowy and Butler among the first to reach the line from the peloton (Butler said he was first - confirmation from our roving reporters?). Israel’s first Pro Cycling Team to turn Pro-Continental in 2017. Following two seasons in the Continental rank, Israel’s only pro team: Cycling Academy Team, is planning to make the move to the Pro-Continental ranks in 2017. Team aims to compete in the Tour of California and the Classics in 2017, eyeing a Gran-Tour debut in 2018. Team is currently negotiating with several key riders and technical partners. The “Start-Up” team, which was launched at the end of 2014, recently concluded an extremely successful spring campaign, with 2 stage wins at the Tour de Beauce (Canada), 2 Stages and the GC at the Tour of Hungary and 7 National championship titles. “I believe that the team’s recent success and the ongoing changes in the Pro Cycling world, will turn out to be favorable for us” said Team Cycling Academy founder and owner, Mr. Ron Baron. Baron, a businessman and himself a cycling enthusiastic, pointed out the diversity of the team distinct from other pro-cycling teams in the world with this innovative approach, as its trademark. With an experienced roster of riders such as Dan Craven(Namibia), Guillaume Boivin(Canada), Chris Butlerr (USA) and upcoming young talent like Luis Enrique Lemus (Mexico) Daniel Turek (Czech Republic) and Mihkel Räim (Estonia), the team was able to build one of the most solid Continental teams in the world of pro cycling. As a born and raised Israeli team, one of the Academy’s key goals is to support the development of Israeli riders, who represent the majority of team riders. “I’m grateful that we have the trust and support of so many friends who have recently shown their faith in our project.” said team manager and former pro rider, Ran Margaliot. “The support of people like Sylvan Adams, makes all the difference for us. This generous support will allow us to make history and become a Pro-Continental team in 2017”. The team is reported to be in ongoing negotiations with several key riders and technical sponsors for 2017 and beyond. More details will be released in the upcoming days. Seems the talk is being turned into actions. Exciting days, but I just hope it doesn't change the feel of the team too much. At the moment to me, they feel like a bit of a cult team (in the non-Danish sense). Will the proposed move up mean a different mindset and change in attitude? The transfers will be very important in that respect. One could be a good example to follow, they had a bit of a shaky time at the start of their Northern European season, but their fairly modest signings (Smith and Domagalski are two that spring to mind) have been getting performances and results. No need always to go for a big name. I'd be looking at people like Carpenter or Huffman if they're after more US riders. Not sure about any names to bolster the team for "classics". They will most likely do an audition training camp again to find new riders. And they're going for Israeli riders plus riders from 'non-traditional' cycling nations. I'm confident the team won't abandon that concept all of a sudden, it seems to be built on a very stable idea of developing cycling, not going for short-term success (although nobody minds success if it comes about). Their next race after Valle d'Aosta will be the GP Kranj, I don't know what comes after that. They'll have Craven and Lemus at the Olympics though, that much I know. Boivin is on the indoor trainer, but he's not on the roster for any of the remaining 2016 races. No point in rushing it after the crash he had. Korus lost motivation, went back from to and hasn't touched a bike in months. Malovec's U23 Slovakian Champ kit. It wasn't that much of a surprise that the run of success didn't continue at Valle d'Aosta. Tough weather, tough opposition and a tough parcour along with an inexperienced line-up. The TTT actually went okay with a mid-field finish, but I wouldn't draw too much from that. The other four days it was more about survival (and survival is no mean feat, as a comparison nobody from Team Ecaudor finished last year). Surprisingly it was probably the two least experienced riders who made it to the finish. Yechezkel was in the break on stage two, but got dropped fairly early and then DNFed the next day. Sagiv and Malovec were (pointlessly?) sacrificed on the penultimate day in an effort to get Hadari and Goldstein in a good position on the final climb, which they succeeded in doing, but were DNFs themselves. But they all felt , in a way, that this experience will make them better riders. Every one of them faced moments of crisis and did not succumb. In the last climb of the 3rd stage, somebody crashed into Sagiv's bike and it took eternity till he got a new bike from the natural car. And it turned up to have the wrong pedals. He never gave up, battling "the thoughts climb I ever faced " - and made it. Zohar, who had his ups and downs this year, recalled the longest moments of facing the last climb of the whole tour. " It was 20 percent at some point... and the only thing I was thinking about is , just don't give up now. Don't break to pieces now. I was so relieved when I made it. I think that it brought me to a new level". Omer Goldstein, echoed those words. He was, no doubt, the most pleasant surprise. Just joined the team. Just 19. "I was very impressed by Omer" said our sports director Matteo Algeri. " To face the hardest race in your first steps as a pro, especially when you are so young - is very impressive". Omer crashed in the 4 stage and suffered mightily. But he made it. " In the last climb, Zohar was talking and encouraging me" he recalled. " That helped me so much... I am grateful that I experienced this and have no doubt that we will come back here much stronger next year. Not only me. All of us"! I don't want to rain on his parade, but only Omer himself will be young enough next year to compete, so without some young transfers this could be one-off visit to Aosta. Tel- Aviv. ( July 22) : Israel’s first pro cycling team makes its own history again: The Team was just confirmed to race in the world championship Team Time Trial to be held in Doha, Qatar. The team who was founded just 20 months ago is one of only 4 Continental teams that got the coveted Wild card invitation from the UCI to compete in the October 9th TTT. “To have the chance to race with World pro teams in the top stage of pro cycling is a great honor and the utmost recognition of how far we have got since our first days less then two years ago” said team founder Ron Baron. The team looks upon the TTT race in Qatar as one of the hardest challenges it faced so far. Accordingly, it was decided to recall all riders back to Israel for a special Negev desert training camp in order to simulate racing under the scorching heat conditions expected in Qatar. “ We will do everything to justify this invitation” said Team manager Ran Margaliot. “ But we welcome the challenge since it will demand everything from us: perfect coordination, top shape and the ability to bring a group of individuals to perform brilliantly together. We will send to Qatar riders from 6 different countries, so the challenge will be even more complicated”. Leading The Team TTT will Be Israel’s TT Champion Aviv Yecheskel. “ It will be very special for me and for the whole team to race in Qatar . For me, racing in this top level is a dream come through”. Expected to race for Academy is Namibian Road champion Dan Craven who said that “ The way the team has grown over the season and the riders that have come together as a unit, its only fitting that the TTT will be our last race this season, one last hard effort to remind us all what lies ahead for us next year as a pro continental team”.